If you are looking for alternative colour lipglosses or lipsticks – there is solution. You can alway try to mix diferent lipglosses/together together… but what if you are lookin for different colours like blue, green? 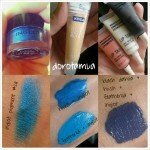 – add eyeshadow pigments to vaseline or your lipgloss. Mixed with different colours you will get comepetly new shades. I have used Inglot #58 pigment with Nivea lipgloss and OCC liptar…as you can see on picture – each colour recived is in different shade!